The chapel at the Mission Inn is stunning and is a National Historic Landmark with two original stained glass windows by Lewis Tiffany, yes, that Tiffany, and an alter that is 25 feet tall and 16 feet across completely covered with three coats of 18-karat gold leaf. The ‘Garden of Bells’ has over 800 bells including one dating to 1247 described as the ‘oldest bell in Christendom’. In 1932, son Frank Miller, who had by then taken over for dad, C. C., put up a ‘Famous Flyers Wall’ recognizing over 150 notable aviators. There are so many nooks, crannies, artifacts and stories that go with them that I couldn’t begin to cover them all here; those who have been there know what I mean and I’m not a good enough writer to describe it to those who haven’t – just go! Our docent worked overtime as after our tour she took us to the Presidential Lounge and asked us to get an adult beverage and follow her to a roof-top terrace where we watched the sunset. She told us that a song popular at the beginning of the 20th century, was written by Carrie-Jacobs Bond, a hotel guest in 1909, and was composed as she watched from the hotel as the sun set behind Mt. 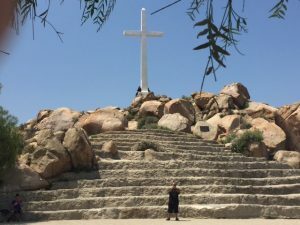 Rubidoux, just as we were doing. The song is called ‘The End of a Perfect Day’ and I think it accurately summed up my time there. 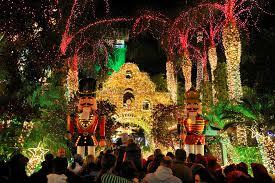 Most visitors like to go to the Mission Inn during the holidays when it is resplendent with nearly 4 million Christmas lights and 400 animated figures, but I’d never gone thinking that I hate crowds and Google has lots of pictures, but now, after seeing how amazing this place is, I can’t wait to see it over the holidays this year. 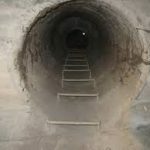 Besides, I know there’s some secret tunnels and catacombs just waiting to be uncovered . . . that would make it ‘The End of a Perfect Day’. 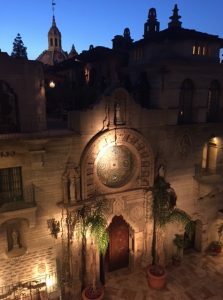 The Mission Inn and Mt. 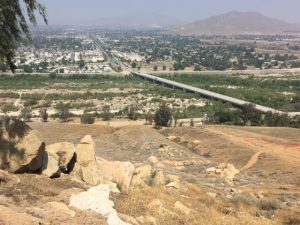 Rubidoux Tunnels? A mountain to climb and a visit to an iconic California hotel that has been rumored to be haunted was all I needed to inspire my trip to Mt. 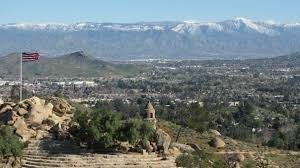 Rubidoux and the famous Mission Inn, just 45 minutes away in Riverside. 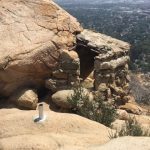 I had no visions of having a paranormal experience or even finding the secret catacombs that supposedly connected these two landmarks which are a mile apart, but it might be fun looking for them and I thought you’d enjoy the journey. 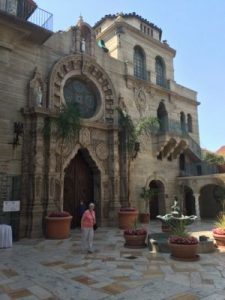 Unable to use the ‘secret passageway’, I was forced to drive the mile to the Mission Inn for my docent-led 75-minute tour – well worth the $13 price tag I might add. The docent, who fortunately had a great sense of humor, introduced herself and asked our group if there was any part of the Inn that was of particular interest to us. 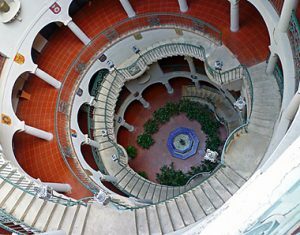 I saw this as my opportunity to broach the subject of the ‘secret passageways’ and asked, “Are we going to get to see the passageways, catacombs, tunnels or whatever that connects Mission Inn with Mt. 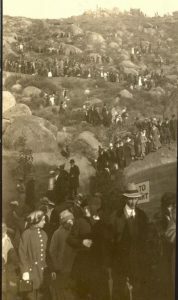 Rubidoux?” The docent rolled her eyes, ignored the question and started the tour. 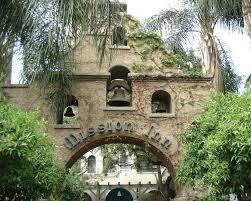 We are first told what the Mission Inn is not; it is NOT part of the chain of 21 historic Spanish Missions in California, but rather it was built as a small hotel by Christopher Columbus Miller in 1876, and because Miller was a world traveler (not a surprise with a name like Christopher Columbus), the 30-year construction of the inn was influenced by many architectural styles: Spanish Gothic, Spanish Colonial, Moorish, Renaissance and Mediterranean Revival to name just a few. To my layman’s eye it looked like six committees from six corners of the earth worked on this project independently and Miller just glued them all together for the finished product, but somehow it works – it’s magnificent! 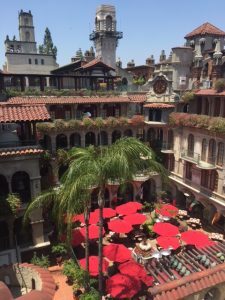 If you’ve never heard of, much less visited, the Mission Inn, let me start your edification of this unique hotel with a list of a few of the august luminaries who have stayed there. US Presidents: Benjamin Harrison, William McKinley, Teddy Roosevelt, William Howard Taft, Herbert Hoover, John Kennedy, Gerald Ford and George W. Bush. Richard Nixon and Ronald Reagan were married and honeymooned there. Let me rephrase that; Richard and Pat Nixon were married there and Ronald and Nancy Reagan honeymooned there. Glad we cleared that up! Why so many presidential visitors you ask? Not that I’m obsessed or anything, but I think it goes back to those tunnels as a security measure; if we ever had an emergency that required us to go to ‘DefCon4’ while a president was staying at the Mission Inn, they would have a secret underground escape route. OK, maybe that’s just the conspiracy theorists in me talking. Entertainers: Clark Gable, Spenser Tracy, Harry Houdini, W.C. Fields, Bette Davis, William Boyd (Hopalong Cassidy), he actually worked there for a while as a chauffeur. Numerous movies have been shot there. Will Rogers probably defined the Mission Inn best when he said . . .
I’ve just read a book by a sociologist about the divergence of the American population. The book is alternately fascinating, frightening and boring as hell, but since I was a Sociology major in college I found it mostly interesting. And, as an added bonus, it goes a long way toward explaining how we ended up with the current slate of Presidential candidates. But that’s a story for another day. What caught my interest was the author’s timeline for changes to the American culture, beginning in the early 60’s. He described a world back then that is barely recognizable today. It got me thinking about all of the conveniences we take for granted that are, historically speaking, really rather new. I’ve always thought that our parents lived in the most rapidly changing time – going from Model T’s to the International Space Station – but for us Baby Boomers (and let’s face it, our subscriber base tilts to grey hair) the changes in how we live our daily lives has been just as extraordinary. In case you’ve forgotten, here’s some reminders of what life was like 50 years ago. Television – First of all, if you were lucky, you had a console TV with an antenna on the roof that received signals from FOUR stations. We thought we had all the choice in the world! At 6 pm one could watch Huntley/Brinkley, Cronkite, Amos n’ Andy or the local weather on the independent station. For those who did not have an antenna, tin foil wrapped around the “rabbit ears” was the next best solution. As a kid, I often had two jobs – stand at the TV and move the rabbit ears around to improve reception (which varied by the moment) and change the channel. No remote control, no 500 channel cable packages, and no “smart” TV’s. 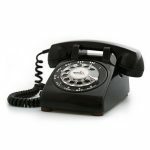 Telephones – By the early 60’s almost every American household had a telephone. All of them were black with a rotary dial. It would be a few years before we marveled at the colored “Princess” phones with touch keys. Phone numbers started with names. Ours was TWinbrook 2-3537 (it’s amazing I can remember that but not my current computer password). Usually there were just one or two phones in a house, permanently secured to the wall in a central location. As a teenager the major drawback to this was that anyone could – and did – listen in on your conversations. Although land-line technology hasn’t changed all that much in 50 years there is one difference in how we use phones – answering systems. Back then if you called someone and they weren’t home, the phone just rang and rang until you gave up. In business, you would leave your office for an hour and return to find your desk papered with those pink “While You Were Out” notices. We somehow managed without answering machines, voicemail and cell phones. Computers – Nothing has changed everyday life in America like the advent of the home computer. We now can know anything. All the information you might want is a Google search away (see Research below). But computers have also changed the way we communicate. 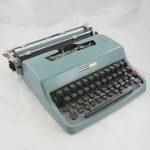 Fifty years ago if you wanted to send a quick note to someone you hand wrote or typed it. You then placed it in an envelope, put a stamp on it, deposited it in the corner mailbox and waited a week for it to arrive at its destination. At the office you received mail once a day. If something you needed to work on didn’t arrive in that day’s mail it was the perfect excuse to spend the day wandering around the office chatting with co-workers and taking an extra-long lunch. The advent of email has made social interactions much easier and probably increased the national productivity tenfold. As for looking things up…see the next section. Research – Back in the day, when teenagers wanted to escape their parents for a few hours they would say “I’m going to the library to look something up”. Some families were fortunate to have an Encyclopedia Britannica (sold to them by a door-to-door salesman) but most of us had to go to the library, which was code for meeting friends, goofing off and checking out some random book to take home as proof that we were actually there. Today, 78% of homes in America have computers and we can assume that if we just counted households with children that number would be much higher. So now kids have all the information they need at their fingertips right in the comfort of their own home. I wonder what excuse they use these days to get out of the house? 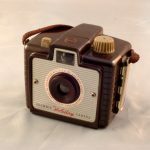 Photography – Almost every household in the 1960’s had some model of a Kodak Brownie camera. They required rolls of film and blue flash bulbs that usually rendered the subjects blind and resulted in pictures where everyone’s eyes were closed. In 1963 the Polaroid camera became a sensation because the photo spewed out of the camera. The photographer waited one minute and then pulled the negative portion away from the “positive” photo and VOILA! – you had a grainy, wet memento. Serious photographers still use real cameras with real film, but most photos today are taken with a cell phone. No film, no taking it down to the drugstore, waiting a week for it to be developed, and no more half a roll of useless pictures that end up in the garbage (or, in the case of our mother, kept in a drawer until she died so we could throw them in the garbage). We’ve come a long way in 50 years. Kids growing up today must cringe at how primitive our lives were back then. But on the flip side, we could play outside in the neighborhood until dark and our parents didn’t have to worry. We had more chores than homework, which instilled a good work ethic. We learned how to read maps without GPS and to cook food without ‘nuking it. On the whole, our lives were lived at a slower pace and without access to everything all the time. I don’t know about you, but I wouldn’t change that for the world. My formal introduction to the ‘treasures of the desert’ probably took place in the early 70s, when brother, Jack took a job as restaurant manager at Ironwood Country Club in Palm Desert and he invited me out for a weekend. I believe it was in March and I was teaching school in southern California at the time; I remember thinking as I made the drive to Palm Desert just how close the desert really was – only about an hour and half drive and yet, I was to find out, a world apart. And while the weather was certainly nice in Orange County in March, it was amazing in Palm Desert, especially the nights. I remember sitting out on a beautifully clear evening with a billion stars all around, wondering how long this had been going on – apparently for quite some time. My love and fascination with the desert and its flora and fauna has continued to this day. 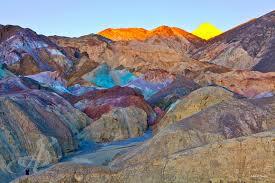 I was amazed at the colors and the shear beauty of the desert on my first visit to Death Valley where I was also intrigued with ‘desert stories’ like that of ‘Scotty’s Castle’. My two treks through Joshua Tree National Park introduced me to unique rock formations, eerie hidden caves and spectacular views. My hike through Havasupai introduced me to the extraordinary water features in what was seemingly a dry, desolate desert. I recently visited the Desert Museum in Tucson with niece, Shelley Watson and continued to be amazed at all the beauty and life that exists in the Arizona-Sonora desert. The Raptor Show, featuring Ravens, Great Horned Owls and Falcons was remarkable! Aside from the ‘family treasures’ in the desert, such as my sister, Suzanne living in Scottsdale and my sister-in-law, Starlet in Apache Junction, there’s a small oasis about three-and-a-half hours from home that calls to Linda a couple of times each year; you might know the place . . . Las Vegas. Linda has not met a Top Dollar slot machine that she doesn’t think she can hit the ‘big one’ on, so for her birthday each year, I ‘surprise’ her with a trip to visit our money. This year we did manage to salvage a little education out of the trip with an excursion to Hoover Dam, the building of which was amazing. With all the hikes, excursions, timeshare in Palm Desert and trips to Vegas, you’d think I’d have my fill of the desert, but no, there is yet another pilgrimage that we make each year and from which I have just returned – Primm. Primm, or what used to be called Stateline, is on the California-Nevada border, and at first passing you wonder why anyone would stop there with Vegas just 30 minutes away. 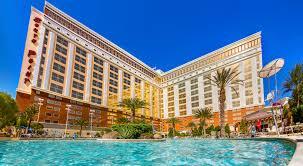 The answer is Primm’s two 18-hole golf courses, which have a unique history of their own. Famous golf course designer, Tom Fazio, was contracted by Steve Wynn to design the golf course at the Wynn Hotel in Las Vegas, under the condition that he would not design another golf course in the state of Nevada. Thus, the two magnificent courses he designed at Primm are just over the border in California. 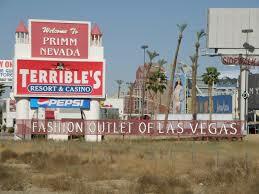 A small wrinkle in the Primm trip this year was, for the first time, we didn’t stay in Primm. While the golf courses are top quality, the Primm Resort & Casino would be lucky to get the tip of one star in a five-star rating. So, one of this year’s organizers, Chuck Sager, who has ‘connections’ at South Point Hotel & Casino in Las Vegas, suggested a change of venue. 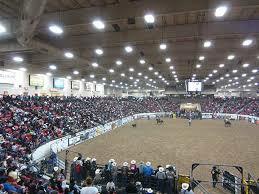 The South Point Hotel is very unique among Las Vegas hotels – it has 124 bowling lanes as well as horse stables and a full equestrian center, where, last weekend, many of us witnessed our first rodeo. It is truly an amazing place. Thank you Chuck! 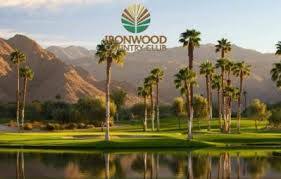 We also changed golf courses to Rhodes Ranch, another ‘treasure in the desert’. A tradition at this gathering is a large bet on the Kentucky Derby. We have two legitimate ‘pony players’ in the group, Jack Budd and Russ Osborne, so everyone gives them $105 and they make some sort of boxed, parlay, quinella bet to heighten our interest in watching ‘The Derby’. We actually won about $24,000 in 2011, of course it was split amongst 24 people, but still, it was a lot more fun than losing, or winning the way we did this year. Jack & Russ actually picked the top 4 finishers, but because they were mostly favorites, our $105 bet got us a $30 return, so ‘winning’ produced a $75 loss. 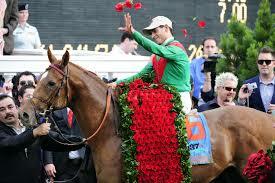 But it was exciting for a moment, before we realized that winning was actually losing – more mysteries of the desert! Whether I’m hiking, exploring, golfing or just losing money, the desert continues to lure me to its hidden treasures. 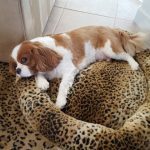 Dash the Wonder Dog is three years old which, for a Cavalier King Charles Spaniel, equates to 28 human years. In other words – he is a millennial. But it’s not only his age that puts him in that category. He also fits into that demographic through his actions, or better put, his inactions. To wit: he still lives at home with his parents, he lies around all day on the couch watching television, he expects to be served his meals (on time) and he does not contribute one cent to the household coffers. To add insult to injury, he has never barked so he’s not even a respectable watch dog. In fact, the welcome mat our on our front doorstep says “Warning – Dog Can’t Hold His Licker”. Something had to be done. I began to research how he might contribute – nothing too taxing, after all he is the Royal Dog of England. As luck would have it, I stumbled upon “Pets on Wheels” in Scottsdale and decided we should give it a go. 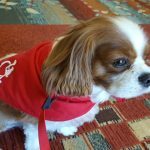 Pets on Wheels was founded in 1990 as a visiting therapy dog organization with the mission of enhancing the lives of the elderly and/or infirm in special care centers. Volunteers visit once a week, providing a bright spot in the day for all of the patients they visit. For obvious reasons one has to jump through some hoops before being approved by Pets on Wheels, so on a bright Saturday morning in March Dash and I attended the orientation meeting. Two delightful women talked about the history of the group and showed heart-warming pictures of dogs (I think some people were in them too) and explained what was required of a dog to be approved for the program. They assured us that the qualifications weren’t too hard – respond well to petting and touching, ignore loud noises, reject any food that may be on the floor, and walk well on a leash. I began to panic. Maybe these two ladies felt that was a rather low bar, but I know that Dash has never rejected a morsel of food in his life. He sits at my feet every night as I prepare dinner, not looking up at me but instead staring straight ahead so that he can best sight any falling crumb. Nothing escapes his steely eyed gaze. As for walking on a leash – I have rotator cuff damage from all the pulling and tugging on our daily walks. But on the plus side, Dash does have his Canine Good Citizen certificate so somewhere, deep in the recesses of his brain, he does know how to use his party manners. I prayed that those recesses would come to the fore. So we started the test, him happily unaware and me nervous as a tick. Of course he loved being petted and didn’t flinch a bit at loud noises. Next we had to walk down a long hallway so they could see if I had him under control. Under control???? Are you kidding? He has had me under his paw since the day we brought him home. He treats my commands as mere suggestions, and usually obeys only if there is a snack involved. But, here we were, being tested and as if the heavens had opened up and angels were sitting on his shoulder, he walked down that hallway like he owned the place. Whew! We made it through the first round. The second phase of approval took place at our assigned care facility, Vi at Silverstone. An experienced observer met us there so he could evaluate how Dash interacted with the inhabitants. Let’s be honest, I think I was also being evaluated but the observer was too kind to tell me that. As we walked into the building Dash immediately lurched to the right. Unfortunately, the nice people at Vi put out a plate of cookies every day for visitors. So Dash, assuming he was an invited guest, thought the warm, fragrant oatmeal cookies were up for grabs. So much for first impressions. The evaluator gave me a look I couldn’t quite place – it was either “Lady, you are dreaming if you think you’re going pass this test” or “Hey, my dog does that too”. Regardless, on we went, visiting the people in the assisted living unit and then the skilled nursing area. Finally, we entered the memory care quarters which requires a five digit code to enter and exit. I am expected to remember it which, considering I am constantly forgetting our four digit security system code, could result in me permanently being locked in. Well at least that would save my family the trouble of having to officially commit me. Luckily my Swiss Cheese brain remembered the code so we returned to the lobby where the evaluator told us we passed. 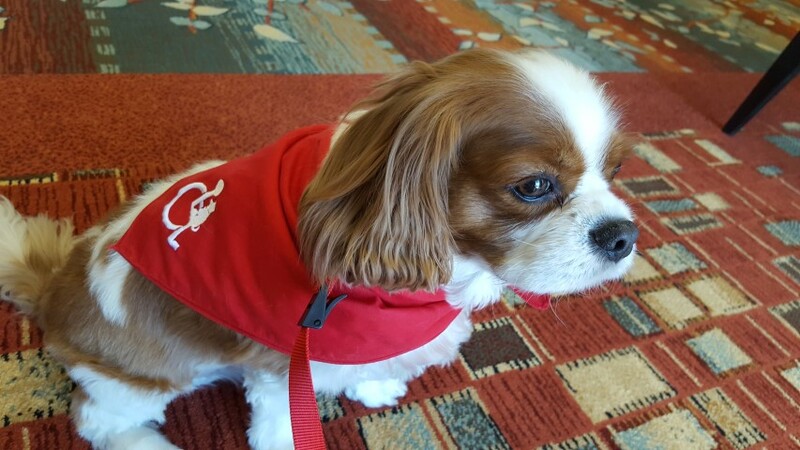 Dash got his official “uniform” – a Pets on Wheels bandana, a leash and a badge. I got one of those oatmeal cookies. In the weeks since being approved we’ve made several visits and Dash has been a champ. I’m not really surprised. As much as he can disobey me at times, he is the very picture of obedience when he is around strangers. He is always patient and quiet, accepting of whomever comes his way. He contentedly sits on laps, savouring every scratch behind the ear or rub on the belly. But of course, the best part of his new job is seeing the faces of people that he visits. Most of them light up when he jaunts into the room and many want him to sit on their bed so they can get a snuggle. Even in the memory unit he is petted and loved and for that instant has made someone happy. As for me, I love doing it too. I think about the day, hopefully very far in the future, when I might find myself in similar circumstances. How joyful it will be to once again feel a furry paw on my hand or a moist lick on my cheek. For now, I’m just happy to accompany Dash to work.